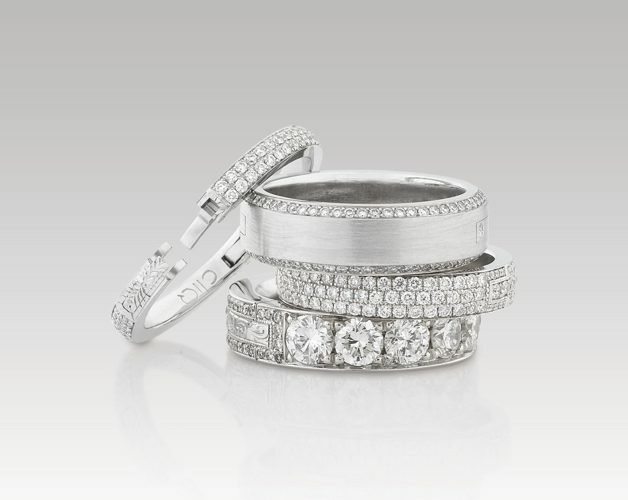 If your ring twists, turns, or is difficult to remove, it's time for a custom fit. Jean-Jacques Mamie Fine Jewelry is proud to use clasps from CLIQ Jewelry. CLIQ’s dedication to combining precise engineering with artisan craftsmanship ensures comfort, security, and a proper fit. Traditional rings have to be large enough to pass over the knuckle. Without CLIQ technology, rings are sized for the largest part of your finger, rather than the base, where it is actually worn. That’s why most rings will twist, turn, and slip off. CLIQ technology eliminates the problem by opening and closing around the base of your finger, in the perfect position. CLIQ’s hinge and latch design is virtually invisible and snag-free- an exquisite combination of micro-engineering and a jeweler’s design artistry. CLIQ adds the ability to open and close, but won’t sacrifice the smooth look and feel of precious metal and will blend seamlessly into any design.